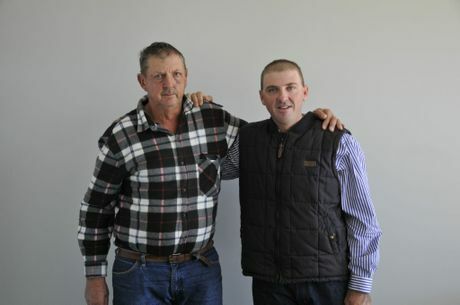 Ian Weier (left) with his son Brent who was fired from the Toowoomba Regional Council parks and gardens department. A CLIFTON father is at his wits' end after his autistic son was sacked from Toowoomba Regional Council parks and gardens department. Ian Weier said his son Brent, 33, who has been diagnosed with Autism Spectrum Disorder had worked without complaint for nine years at the Clifton Shire Council before its amalgamation with Toowoomba. According to the family a change of management six months ago led to a series of warnings and complaints about Brent's work performance. Brent's mother Vanda said the the letters were small, picky complaints such as not filling out his timesheet correctly and using the council vehicle to go home. "The letters started last September. There were six in all and we went to see the manager and tried to explain that Brent was different, but they wouldn't listen," Mrs Weier said. "We're not trying to say that what he's always done is right, but we've been trying to get them to understand Brent is different. "They haven't listened to us and just cried workplace health and safety. "He is a good worker and wouldn't leave a job until it was done. He's never done anything to endanger anyone else." In his role at parks and gardens, Brent worked mainly at Clifton mowing the parks. Mr Higgins said an official complaint was lodged to the Queensland Industrial Relations Commission with a view to having Brent reinstated. Mr Higgins said that at yesterday's hearing seeking a direction, council staff said they had not been aware of Mr Weier's special needs. "Brent's parents called us as a last resort. They had been trying to handle it themselves. "The young fella was diagnosed with autism (and) his parents have been telling them (that) for the last two years. It only takes a little bit to understand that he has special needs. Toowoomba Regional Council Acting Chief Executive Officer Arun Pratap said council was not in a position to make comment on this matter as it was subject to consideration by the Queensland Industrial Relations Commission. The next hearing has been listed for Thursday, June 5.